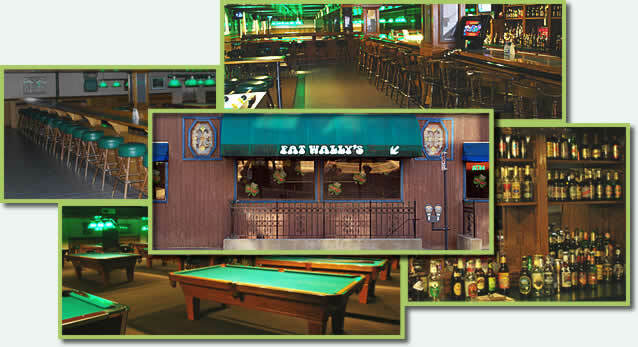 Located on the corner of 2nd Avenue and 5th Street in Downtown Cedar Rapids, it's just a short flight down the stairs to the friendly, clean environment know as Fat Wally's. Billiard, Darts, & Foosball are the fare, but awesome drinks and a world of imported beer will have you sporting a great time also. In 1916 the basement of a Buick Dealer, was revamped into it's first run as an Amusement & Entertainment venue as a billiard hall called Parlor City. The billiard parlor eventually moved to the first floor of a hotel down the street. Time rolled on and in 1932 the location took on a new roll and reopened as a Duckpin bowling alley. The bowling alley prospered through the mid 60's when at some time after, the stairs in front of the building, leading to the venue, were sealed along with the fate of the onetime popular meeting spot. For the next twenty, or so years, storage was the main function of the location, sadly it became just a regular basement. The building went to a new owner in the 1980's. In the back of his head, he always wondered about those stairs in the basement that lead to nowhere. Remarkably, in the early 90's something sparked inspiration in the owner, and he went to work on his idea in 1994. After three long years of remodeling, Fat Wally's opened to rave reviews in 1997, and has been a beacon in the Amusement & Night Life industry of Cedar Rapids ever since. Call it fate, poetic justice, or maybe history just repeating itself. Whichever you may choose, billiards are alive and well in Cedar Rapids, and in the same location they were almost 100 years ago. Copyright © 2013 JLM-Online LLC. All rights reserved.